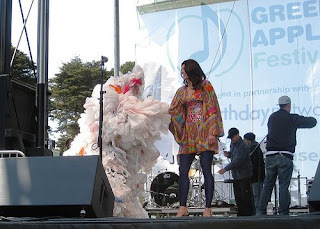 A Bag Monster shared the stage with ChicoBag inventor, Andy Keller, in front of an estimated 30,000 people who had gathered to celebrate the Earth with great music and great speakers… But that Bag Monster would have none of it! The Bag Monster told its story of migrating to San Francisco in the 1970’s in search of tolerance and explained that because of the bag ban, he would move to a city more tolerant of plastic pollution. With the booing from the audience, and Keller’s confident, “I don’t need you anymore Bag Monster, I’ve got my own bag!” the Bag Monster sauntered off defeated, thanks to San Francisco‘s bag ban and ChicoBags.